The lumbar spine is composed of 5 vertebrae which are connected in series and work together to attain motion at the spine. Stability at the spine is essential in order for a desired motion to be achieved in an effective manner. Table 1 describes various structures which may assist with providing stability at the lumbar spine. Along with these structures the abdominal muscles, specifically the transversus abdominis and oblique abdominals, and the multifidus muscle have also been proposed to play and important role in stabilizing the spine by co-contracting in anticipation of an applied load (1). In a case where there is instability at the lumbar spine, a vertebra in the lumbar spine may slip forward out of the proper position onto the vertebra below it resulting in a condition called lumbar spondylolisthesis (see table 2). This slippage of the vertebra onto the vertebra below it could contribute to low back pain along with nerve compression and resulting radiating pain down the lower extremity. Other symptoms patients may also experience include stiffness, spasms, catching pain, tightness in the back & legs and tenderness in the back & buttocks. There are five causes associated with spondylolisthesis. They include isthmic, degenerative, dysplastic, traumatic and pathological spondylolisthesis. 1) Isthmic spondylolisthesis occurs when stress fractures occur at the pars interarticularis and weakens the vertebrae which may lead to slippage (3). It is most common at the L5-S1 segment (3). 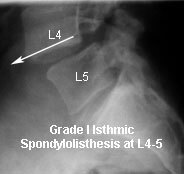 2) Degenerative spondylolisthesis involves degeneration of the facet joints with loss of normal structural support increasing the chance of slippage (4). It is most likely to occur at the L4-5 segment and in older women (4). 3) Dysplastic or congenital spondylolisthesis occurs in children most often between the L5-S1 segments as a result of a congenital defect. 4) Traumatic spondylolisthesis may be due to a violent traumatic injury or participation in certain activities and sports which may put excess stress on the spine. This trauma or excess stress could result in fractures at the spine and contribute to a spinal segment to shift out of place. 5) Pathological spondylolisthesis can be contributed to infections, cancer, osteoporosis, etc. which may affect the articular facets of the spinal segments. Patients with lumbar spondylolisthesis will usually display limited lumbar flexion and report pain is worse when bending backward into extension. With bending forward into lumbar flexion pain may ease for these same individuals. Upon palpation, tenderness and/or a depression at the level of the listhesis may be prominent as well. Various spinal instability tests such as the instability catch sign, painful catch sign and apprehension sign test may be performed during the evaluation but all three lack sensitivity (5). However, a passive lumbar extension (PLE) test developed by Kasai et al (5) revealed in their study that the PLE had a sensitivity of 84.2% for sensitivity and 90.4% for specificity when assessing for lumbar spondylolisthesis. This test involves having the patient in prone and elevating both lower extremities concurrently to a height of about 30 cm from the surface while maintaining the knees extended and gently pulling the legs. Onset of strong low back pain when conducting this test was considered positive for lumbar spinal instability. 1) O’Sullivan P, et al. Evaluation of specific stabilizing exercise in the treatment of chronic low back pain with radiologic diagnosis of spondylosis or spondylolisthesis. Spine. 1997;22:2959-2967. 2) Fritz J, et al. Segmental instability of the lumbar spine. Physical Therapy. 1998;78(8):889-896. 3) Hertling D, Kessler R. Management of Common Musculoskeletal Disorders: Physical Therapy Principles and Methods. Philadelphia, PA: Lippincott Williams & Wilkins; 2006. 4) Herkowitz H, et al. The diagnosis and management of degenerative lumbar spondylolisthesis.. MedGenMed 1(1), 1999. 5) Kasai Y, et al. A new evaluation method for lumbar spinal instability: Passive lumbar extension test. Physical Therapy. 2006;86(12):1661-1667.